The first documented discovery of California gold fields, dipped his sluice pan into a small stream near its mouth at Clear Creek. Ralston found about 1/4 ounce (6 g) of gold then worth about five dollars. Ralston's companions named the stream Ralston's Creek in his honor, but they all left the next morning, drawn by the lure of California gold. In 1870, the Colorado Central Railroad laid tracks through the area on its route from Golden to link up with the Kansas Pacific Railroad and the Denver Pacific Railroad at Jersey Junction, 3 miles (5 km) north of Denver. On December 1, 1870, Benjamin F. Wadsworth and Louis A. Reno platted the Ralston Point townsite along the railroad. To avoid confusion with other communities along Ralston Creek, Ralston Point was soon renamed Arvada in honor of Hiram Arvada Haskin, brother-in-law of settler Mary Wadsworth. Her husband, Benjamin Wadsworth, became the first postmaster of Arvada. 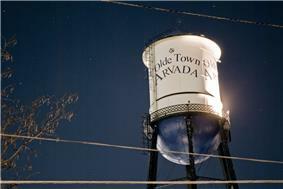 Colorado was granted statehood on August 1, 1876, and the Town of Arvada was formally incorporated on August 14, 1904. A vibrant agricultural community, Arvada claimed the title "Celery Capital of the World." On December 9, 2007, Matthew J. Murray walked into the Youth With a Mission Center in Arvada and, after he was refused his request to stay overnight in the dormitories, opened fire and killed two people, injuring two more. Arvada is located at (39.819962, -105.110975). 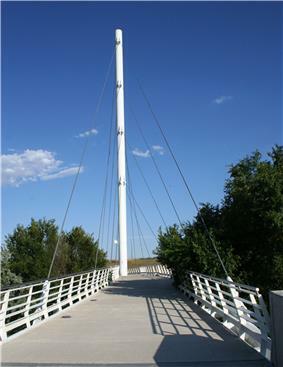 Arvada is the western terminus of Interstate 76, which begins at the intersection of Interstate 70 and State Highway 121. Other state highways in Arvada include SH 72, SH 93, and SH 95. Major highways near Arvada include Interstate 25, Interstate 270, U.S. Highway 36 and U.S. Highway 287. The Denver Regional Transportation District (RTD) currently serves Arvada with eight local bus routes (31, 50, 51, 52, 72, 76, 80, and 100), four express bus routes (55X, 58X, 72X, and 80X), and one regional bus route (GS). RTD plans to provide Arvada with a commuter rail Gold Line along the old Colorado Central Railroad route (now operated by the BNSF Railway) by 2015. In 2014 the League of American Bicyclists designated Arvada as a Silver Level Bicycle Friendly Community. Arvada is largely a commuter town to Denver and Boulder. The primary retail corridors are along Wadsworth Boulevard, 52nd Avenue, 64th Avenue, Ralston Road and Kipling Street. ^ a b "City Manager's Office". City of Arvada, Colorado. Retrieved 2011-11-28. 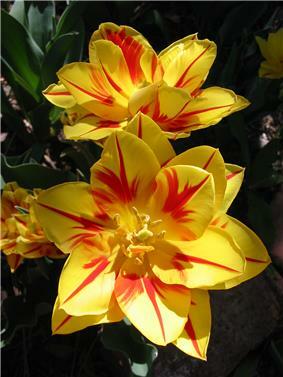 ^ "Profile for Arvada, Colorado". ^ Holusha, John (2007-12-09). "Gunman Kills 2 at Missionary Center Near Denver". ^ "Don Allard, Councilmember At-Large". City of Arvada, Colorado. Retrieved 2011-11-28. ^ "Bob Fifer, Councilmember At-Large". City of Arvada, Colorado. Retrieved 2011-11-28. ^ "Jerry Marks, Councilmember for District 1". City of Arvada, Colorado. Retrieved 2014-02-20. ^ "Mark McGoff, Mayor Pro Tem and Councilmember for District 2". City of Arvada, Colorado. Retrieved 2014-02-20. ^ "John Marriott, Councilmember for District 3". City of Arvada, Colorado. Retrieved 2013-04-16. ^ "Bob Dyer, Councilmember for District 4". City of Arvada, Colorado. Retrieved 2011-11-28. ^ "Weatherbase.com". Weatherbase. 2013. Retrieved on August 23, 2013.